We’ve been busy here at Infinite over the past few months with more businesses than ever wanting Fibre Ethernet and nbn connections! – but we never lose sight of what’s happening in the lives of our team. Have you ever wondered about the person behind the voice at the end of the line? Jonno will cut off his beloved dreadlocks in support of the White Ribbon Foundation, and while all of us here at Infinite proudly support him, we would love if you could do the same. Whether you or your organisation can spare a little or a lot, every little bit helps. 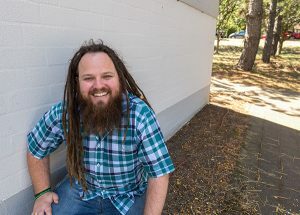 Jonno is hoping to raise more than $2,000, so please, head over to http://nomoredread.com.au for more information or to donate. To help Jonno reach this goal, Infinite has pledged $500 so help us help Jonno reach his goal, and more importantly support the White Ribbon Foundation. Jonno will cut off his dreadlocks at Shine Hairdressing in Civic on Sunday 8 May.